Since it will take a whole week for the stagecoach to return and pick up the young woman who’d been assigned to the hard-hit mining town of Coal Valley for her very first teaching assignment, one week’s trial is how long the widows of Coal Valley will give Elizabeth Thatcher (Erin Krakow) to make a good impression. Having lost forty-seven of their brave husbands and sons in the mine three months ago, the widows eye the young East-coast educated and bred Thatcher suspiciously, wondering if she has what it takes to make it in such unglamorous surroundings. Eager to prove her worthiness, Thatcher promptly tries to exert her independence and proceeds to burn down her new home and every one of her belongings, save for the clothes on her back. And perhaps because this is based on a Janette Oke book (which had already been adapted into a successful TV movie) but assuredly because this is the pilot of a brand new made-for-Hallmark Channel original cable series, the Coal Valley widows led by Lori Laughlin’s extraordinarily kind Abigail Stanton take pity on Elizabeth. While most would’ve sent her packing, Abigail invites her to stay in her home (seemingly without any worry as to whether her cottage will likewise go up in flames). And despite a rocky start, Elizabeth soon finds her footing in her new post, thanks party due to her wealthy shipping tycoon father’s generous donations of school supplies for his daughter’s new school, which (as one of the only positions not owned by the mining company but the widows who pay her wages instead) is currently stationed inside the town saloon. Although admittedly it takes a good forty-five minutes or so for this new series release to really grab your attention due to the changes in casting and the tone of the series which turns the movie’s previously headstrong, brainy girl into a bit of a klutz, the series is so likable that you’re more than willing to remain patient. 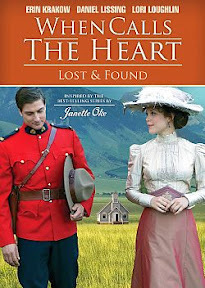 Revising the narrative history established in the previous film so that the Mountie she’d traveled with in the prequel is now a totally new character (played by Daniel Lissing), we discover with the young man’s arrival that her father has pulled some strings in order to get the man assigned to Coal Valley to keep her safe. Resenting the change of post to babysit what he assumes will be a spoiled rich girl, although their relationship gets off on a the wrong foot right away, predictably flirtatious sparks start begin flying by the second half of this Michael Landon Jr. directed offering, which presents the first two episodes together as one feature-length DVD. And just like the potential for romance, the overall series gets much better as the disc continues into its second episode, wholeheartedly earning its many comparisons to Little House on the Prairie, Christy and Sarah, Plain and Tall with added dramatic tension. As the mining company prepares to bring new workers to town to replace the men they’ve lost, the women are threatened with the possibility of losing their homes. Faced with the prospect of having to work in the very mines that killed their loved ones, Elizabeth and the children work together to search through every book they can get their hands on in the hope of finding a legal loophole before realizing that they had no idea what kind of man with whom they were dealing. 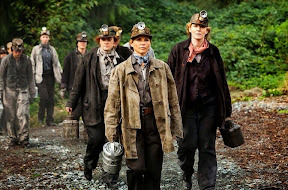 Although it’s old-fashioned nostalgic costume drama escapist fun like an evening of Downtown Abbey, it’s also surprisingly topical given its emphasis on girl power and its threats of energy companies closing in favor of cheaper foreign labor. Just starting to get addictive by the end of the disc, it’s safe to say that the character development and plotlines are sure to improve after the end of Thatcher’s trial period as depicted on the DVD. And with this brand new original series, which offers great roles for a large ensemble female cast (including a terrific return to commercial TV for the talented Lori Laughlin), it’s nice to see that Hallmark is eager to give the fans that cherish their high quality made-for-TV movies more of what they want.